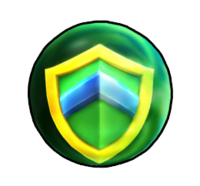 A Shield is an item found in Mario Kart Arcade GP, Mario Kart Arcade GP 2, and Mario Kart Arcade GP DX. Once the player obtains one through an Item Box, the shield is displayed as an item. If the player chooses to use it, they will protected from the other players' items for a limited time. Unlike the temporary shield that can be used by drifting, this type of shield will last much longer. This page was last edited on March 1, 2019, at 01:11.